Beyond providing data for all 32 NFL teams, PFF also supports network broadcasters with game-preview packets that are used to enhance the in-game experience for fans and viewers. This Jets-Browns preview features the same information our broadcast partners use for team research and in-game production. 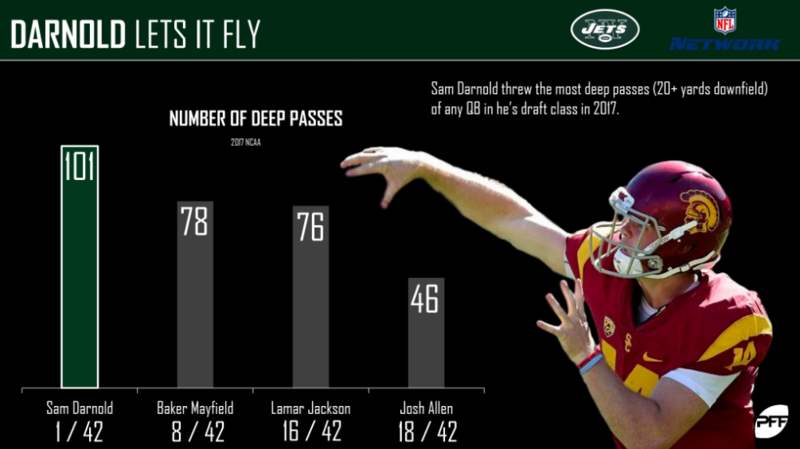 Quarterback Sam Darnold has proved that he’s capable of unleashing the deep ball, as he led the nation in deep pass attempts in his final year at USC. However, he’s been somewhat reluctant to stretch the field in his first two games as a pro – he’s attempted just 10 passes of 20 or more yards downfield so far and completed just two of those passes. 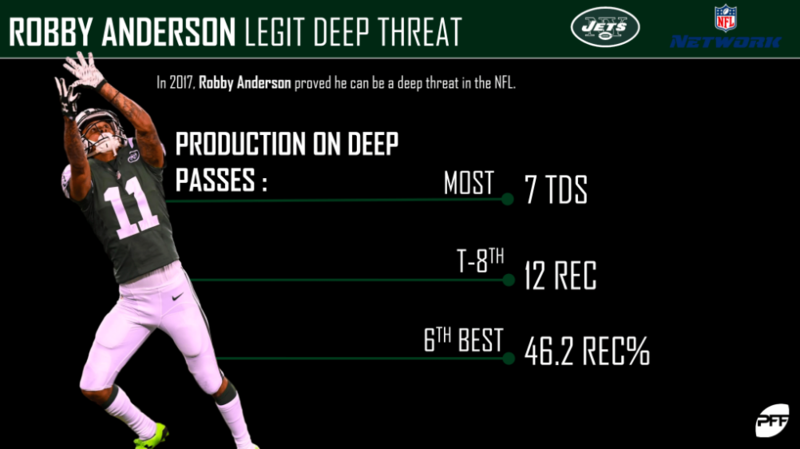 If Darnold is looking to uncork his deep ball, Robby Anderson should be his go-to target. Anderson performed incredibly well on passes of 20-plus yards last year and finished with the most deep touchdowns of any wide receiver in the league. 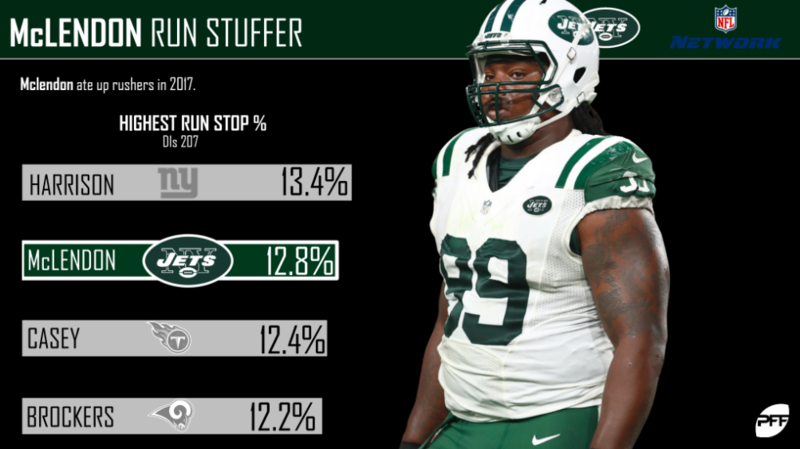 10-year veteran Steve McLendon has been a key asset in run defense for the Jets and finished with the second-highest run-stop percentage among interior linemen in 2017. McLendon’s presence could be a key factor in limiting the Browns rushing attack on Thursday night. 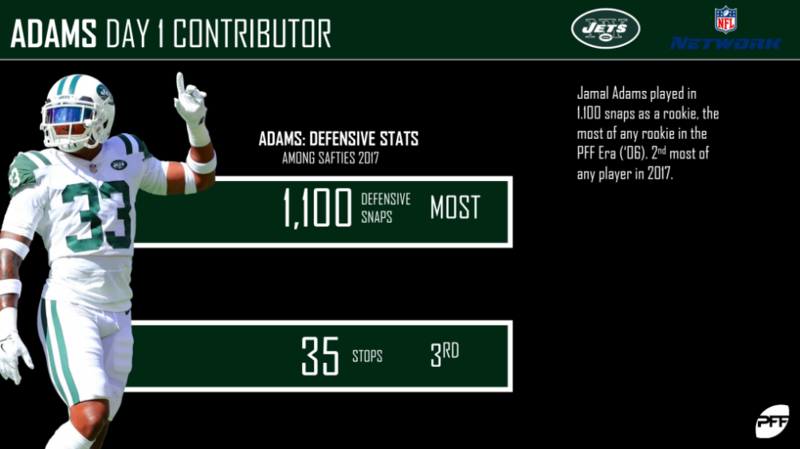 Safety Jamal Adams has been a consistent force for the Jets ever since he was selected with the sixth overall pick of the 2017 draft. In his rookie year, Adams played a whopping 1,100 defensive snaps and produced more defensive stops than any other player at the position. Expect to hear his name early and often on Thursday night. 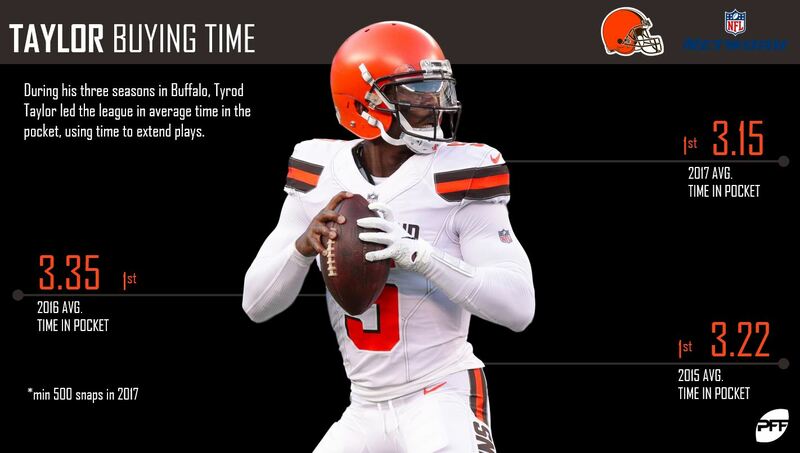 Quarterback Tyrod Taylor has shown that he can move the pocket and keep the play alive. In fact, Taylor has led the league in average time in the pocket in each of the past three seasons. This season, he has averaged 2.96 seconds in the pocket, which is tied for fifth-longest among qualifying quarterbacks. 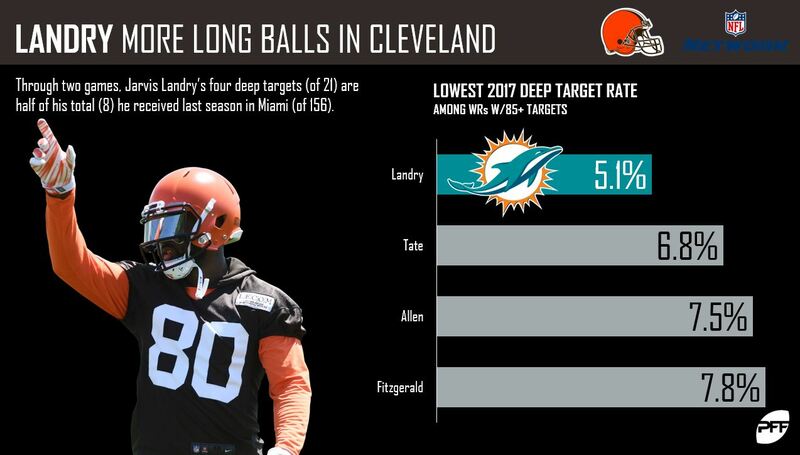 Through two games, wide receiver Jarvis Landry has seen four targets of 20 or more yards downfield, amounting to 19 percent of his total targets. Last season, he finished second in the NFL with 156 targets, however, only eight of said targets were of the deep variety. 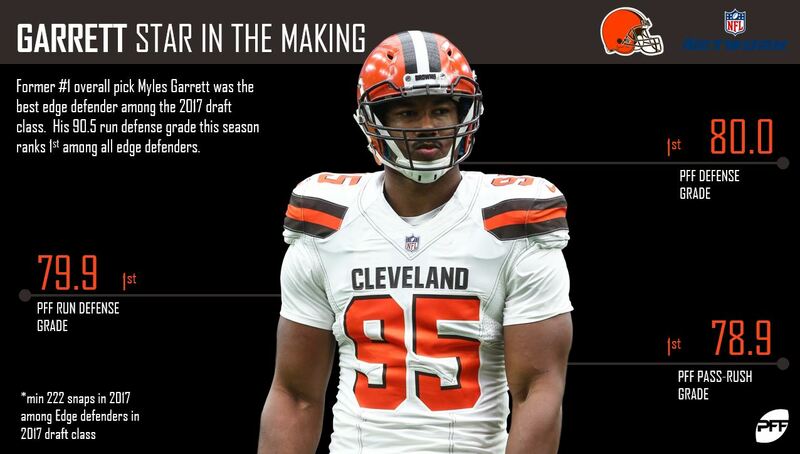 Myles Garrett was the standout of the 2017 draft class, as he posted the highest run-defense grade, pass-rush grade and overall grade among rookie edge defenders a season ago. This season he picked up where he left off, particularly against the run, posting the highest run-defense grade (90.5) among edge defenders. 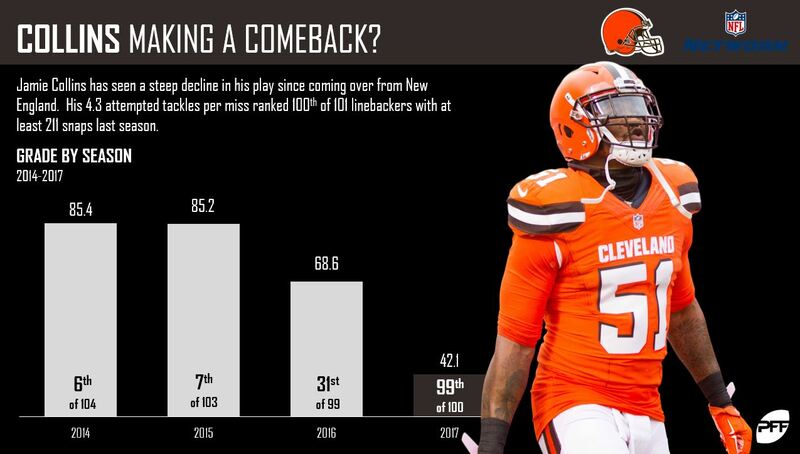 Linebacker Jamie Collins had a 2017 season to forget, earning a 42.1 overall grade, the lowest of his career. After two games, his 2018 season is trending towards a rebound year, as he’s sitting at a 65.1 overall grade, which ranks 35th among off-ball linebackers.